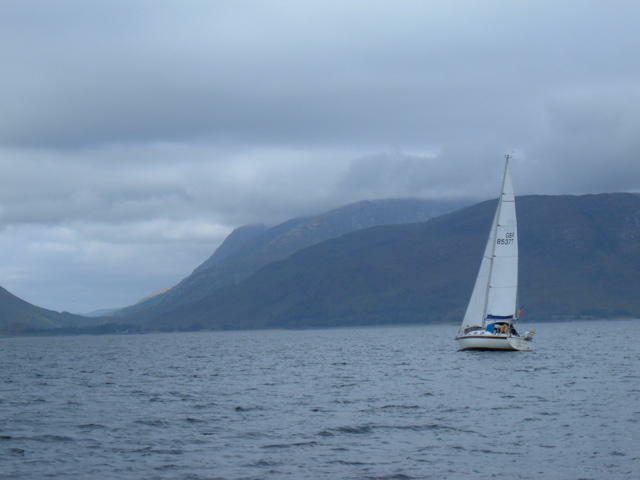 We spent the morning doing exercises on Loch Leven: man overboard under sail; and blind navigation, which was entertaining but I put us much closer to the shore than I thought! All good fun. 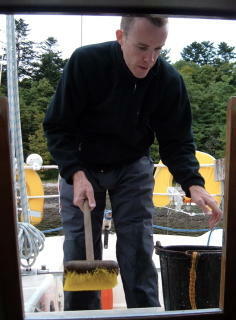 Our final task was to clean the boat from top to bottom. Dominic and I drew deck scrubbing! 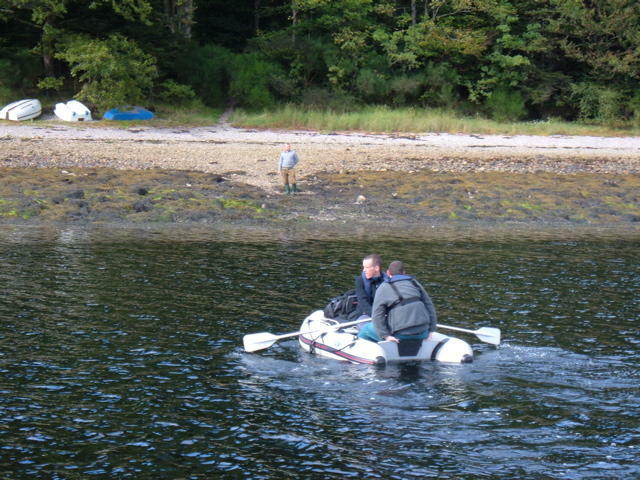 Once again I provided the dinghy ferry service back to shore for crew and luggage, apart from the final trip back with Paul in the fibreglass tender. Graham’s last shot of the boats at anchor captures the beauty of the spot. For Graham and me it was a short walk to the Loch Leven Hotel for a well-earned bath and relax on a proper bed, before we met Alec for dinner. The hotel is very traditional but the restaurant has been given a facelift and serves excellent food. Alec is sailing with us – and will probably be skipper – on our Canaries cruise this Christmas. We all got on very well and finished the evening with large whiskeys all round. I must thank Graham for his lovely photos. More are online via our pobox site. I woke early and took a short run on Kerrera, frustrated somewhat by endless farm gates. My last training before the Great North Run! 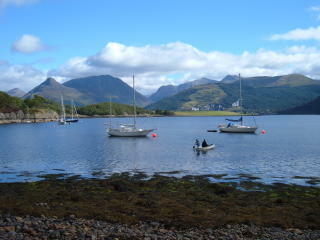 In beautiful weather we returned under sail and later motor to the mooring at Ballachulish. 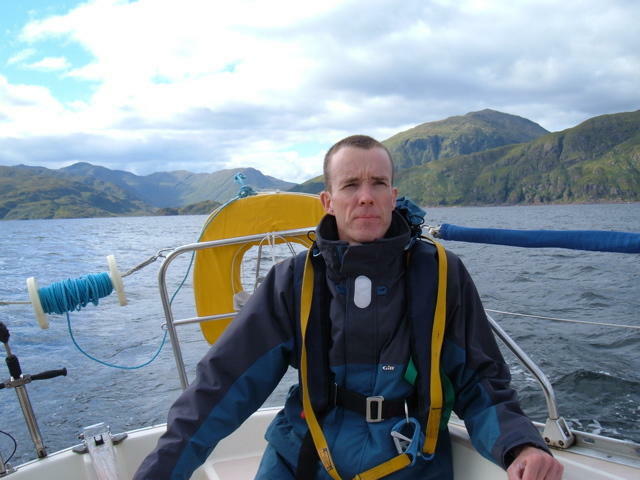 En route I practised steering the boat with sails alone (simulating a rudder failure), and we had a rather disturbing incident which was safely resolved – ask me if you want to know more! Sailing up Loch Linnhe towards the entrance to Loch Leven was magical, with the mountains all around and Ben Nevis looming directly ahead behind the lower mountains on the shore. Simply spectacular. We had a busy day! I piloted us into Loch Spelve, short-tacking through the narrow channel with shallows on one side and hidden rocks on the other. 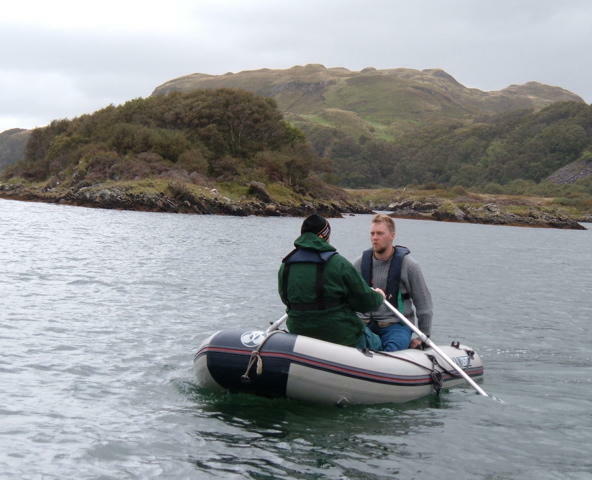 We lunched whilst hove-to in the loch, and then sailed over to the beautiful anchorage of Puldoran (Puilladobhrain), practising the use of a pole for the genoa and a gybe preventer for the main. At anchor in Puldoran, Dominic and Neil practised rowing in the dinghy, we dined, and then we waited until it got dark. 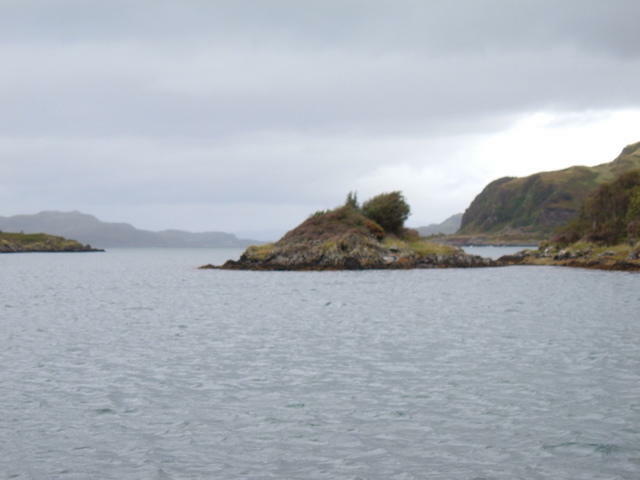 For the night sail, I piloted us up the channel between the mainland and Kerrera and into Oban harbour, for a quick tour of the southern half, before Graham took over to show us the northern half. A close (but not too close) encounter with a departing trawler added to the fun and gave us some steaming lights to practice on too. A great night passage, and very different in character to all the lights of Harwich and Felixstowe and all those buoys up the River Orwell. 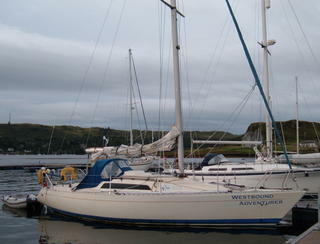 Before midnight, we were moored up at the marina on Kerrera. 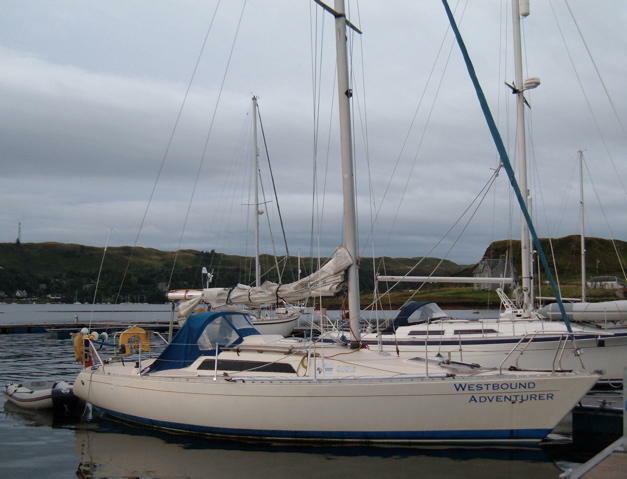 The weather forecast was for a big blow so we reefed the boat right down and had a fantastic sail in winds of force 6 and 7, gusting to 8 on a regular basis. Exciting stuff, made possible by the shelter of the Sound of Mull. Had we been the other side of Mull it would have been a different story: nothing but an endurance test. 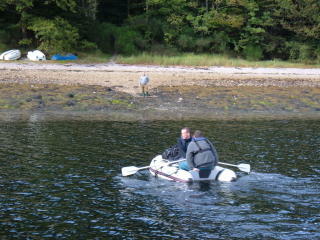 As it was, we all had a great time and Neil and Dominic lapped it up for only their second day on a yacht. We eventually sought refuge in Craignure Bay, watching the ferries come and go from Oban as if it was only a light breeze. We woke to the beautiful scenery of Loch Leven and Ballachulish. A gentle start, going over the boat and the safety briefing. The crew: Paul, our skipper and instructor; me, doing my Coastal Skipper practical course; Graham, for his Day Skipper practical; and Dominic and Neil who had never sailed on a yacht before, both taking the Competent Crew course. We had a beautiful sail down Loch Linnhe calling in briefly at the marina tucked in behnid Shuna for water, and then running and goosewinging most of the way up the Sound of Mull into Loch Sunart and thus to and through the narrow entrance of Loch na Droma Buidhe, or Loch Drumbuie for the Gaelically-challenged (i.e. most of us). After a couple of failed attempts we anchored in this beautiful sheltered loch with only a couple of other boats for company. A very pleasant lunch with Graham’s parents and David in Croftfoot, followed by a quick trip to Somerfield where I bought a great Tchibo microfleece top for only £7. We started the next phase of our holiday very inauspiciously by taxi: the first thing the taxi driver did with us on board was to reverse into a lamppost with a very large bang! He seemed unphased, and we continued to Buchanan Street bus station to catch the evening coach to Fort William. The coach kept on intersecting the route of the West Highland Way, bringing back fond memories of our long-distance walk a few years ago. 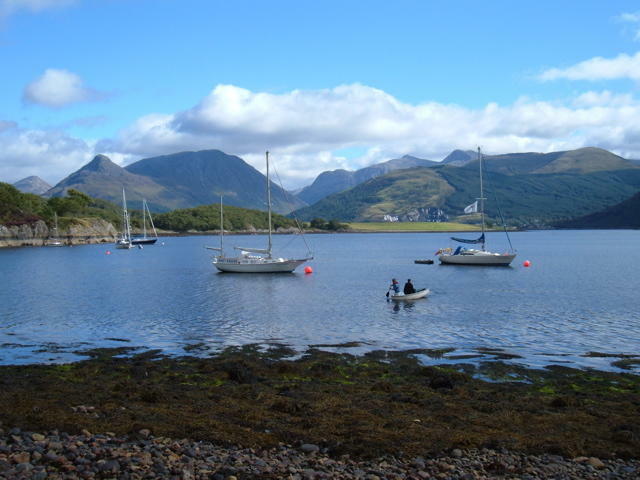 Eventually we reached Ballachulish and alighted at the first stop after the bridge, having discovered our sailing companions for the week when they asked the driver for the same stop. 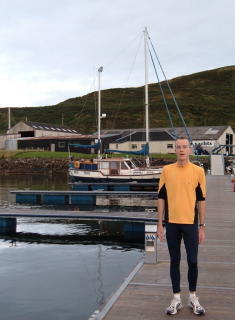 We walked back down to the Loch Leven Hotel and met our instructor, Paul, in the car park. An entertaining start to a sailing trip: into waterproof trousers, wellies and lifejackets; a five minute torchlit walk through the forest to the beach; and relay trips in the inflatable dinghy to our home for the next five days and nights: Westbound Adventurer. The first part of our holiday, yipee! An easy journey north on EasyJet to Glasgow airport where Frank very kindly met us and drove us to George Square, where we singularly failed to find the Premier TravelInn. We eventually discovered that – despite being called the George Square Premier TravelInn – it is actually two blocks away on George Street. Our first room smelled of piss but the front desk was very efficient and moved us straight away, and our second room was up to scratch: fairly basic, but clean and modern and only £54 a night. Dinner at Wagamama and a pint of lovely Deuchars IPA at The Counting House, a Wetherspoon’s which is now no-smoking. On Saturday we took the train to Stirling to visit Nuala and Joel and to see their new house. 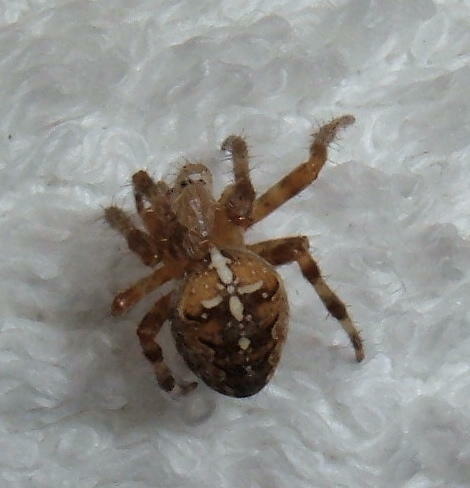 It’s a lovely two-floor upper flat in a small stone-built block, and they look very at home already. After lunch we wandered into town and up to the castle. This is a great place to visit. I was expecting stuffy chambers with suits of armour, but instead found wonderful newly-restored rooms (the Great Hall and Chapel Royal), and fascinating suites of rooms in mid-restoration with explanations of the process, the archaeology and the restoration plans. The castle cafe was good too, but awfully expensive! Dinner in Bridge of Allan at Clive Ramsay: excellent! I’ve just finished Iain Banks’ travelogue, Raw Spirit. It has made me yearn to tour Scotland again, and my whisky consumption is up. On the other hand, I didn’t enjoy the style of the book as much as I’d hoped. I’ve been a fan of Iain Banks since The Wasp Factory, and then of Iain M. Banks. His last couple of non-sci-fi novels, though, have had a certain “look how rich I am and how much I know about expensive stuff” smugness about them, and this carries through into Raw Spirit.